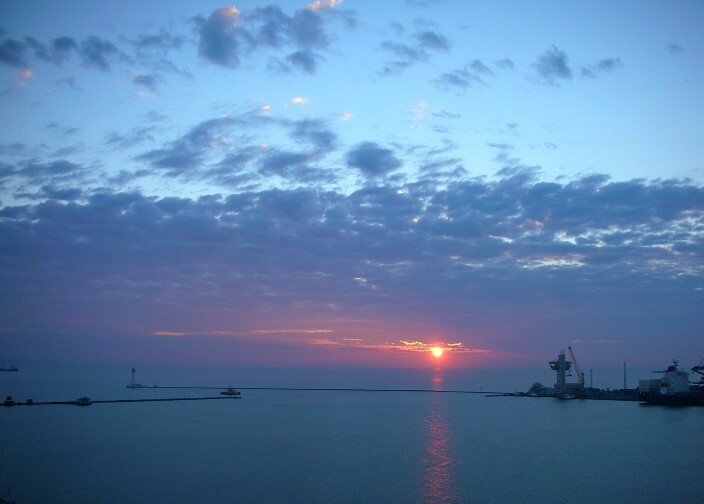 The city of Odessa is located on the Black Sea in the southwest corner of Ukraine, and is the country’s number one seaport and fourth largest city with a population of just over one million people. As with most areas of Ukraine, the history of Odessa is rife with a succession of different rulers and conquerors sweeping through the region. It all began with a Greek colony, followed by various nomadic tribes, the Golden Horde, the Crimean Khanate, the Grand Duchy of Lithuania, and the Ottoman Turks among others. 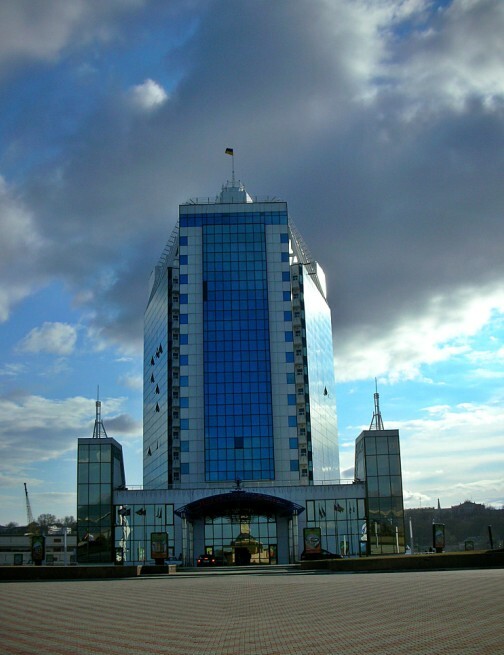 The city as it’s known today was founded by a decree of Catherine the Great in 1794 after the Russian Empire had defeated the Ottomans in the Russo-Turkish War of 1792. 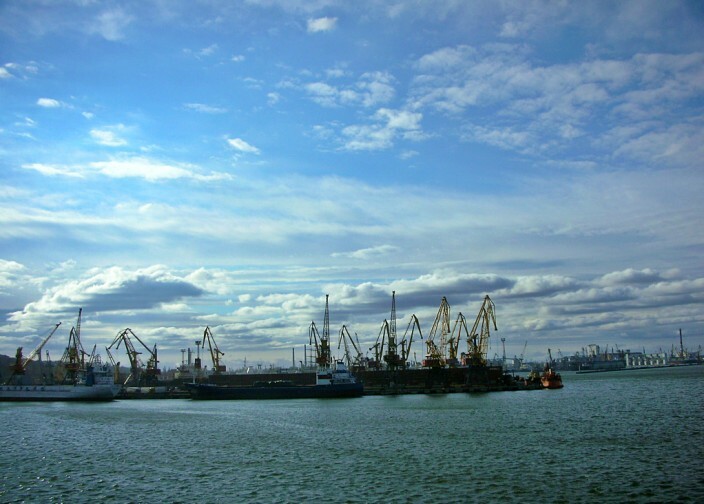 During the Soviet era Odessa was the most important warm water port of trade for the Soviet Union and served as a major naval base. Since Ukrainian independence it has been a free port, linking vital gas and oil pipelines running from Russia to the Euro economic zone as well as being a strategic transport hub tying the country’s vast railway system to the sea. The population of Odessa is about 57 percent Ukrainian, 34 percent ethnic Russian and a smattering of Albanians, Greeks, Turks, Romanians, Tatars, Armenians, and Georgians, among others, making it perhaps the most cosmopolitan of all Ukrainian cities. Until 1940 Odessa was home to the largest Jewish community in Ukraine, but as a result of mass deportation to the death camps during the war, the city’s Jewish population is now only a small percentage of what it was before. 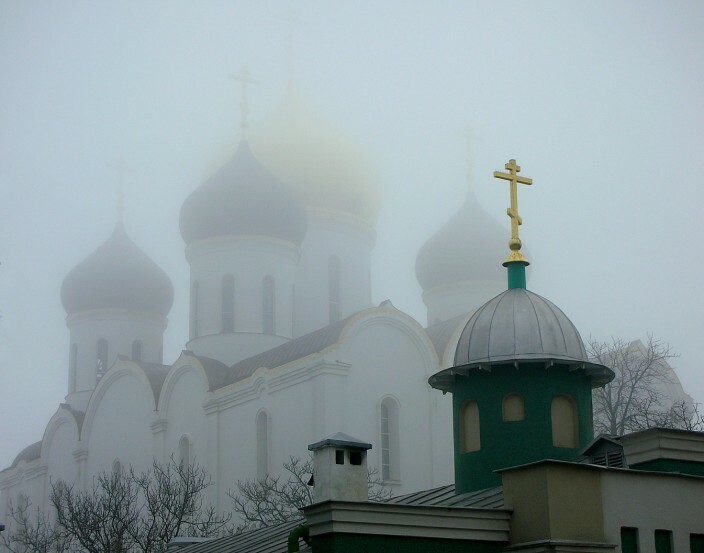 Like most areas of southern Ukraine, Russian – not Ukrainian – is the primary language. 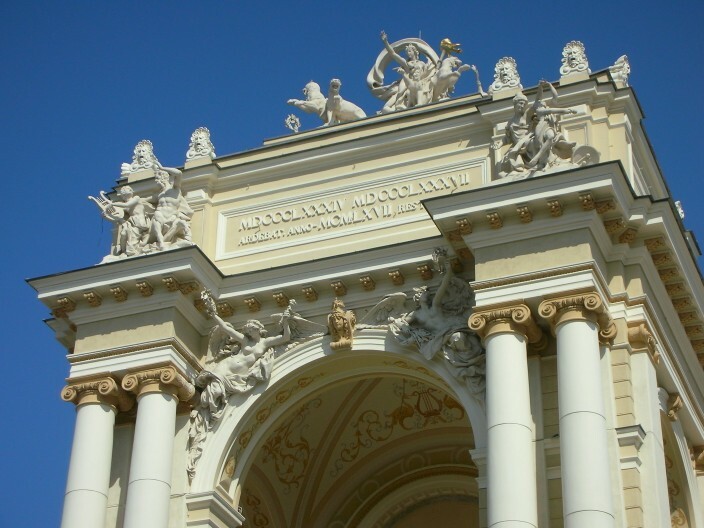 But aside from all that historic and economic stuff, what is there for the modern traveler in Ukraine to see and do in Odessa and why should you bother going there in the first place? I’m glad you asked. If you’re planning to visit in the summer, the weather can be hot and a little steamy but that is easily remedied by a trip to the Arkadia beach area. 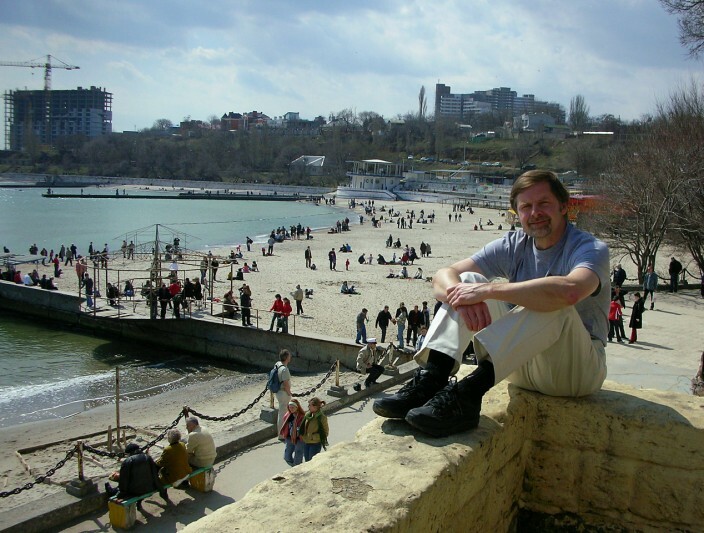 Arkadia is renowned for its beautiful white sand beach, a rarity along the Black Sea coast of Ukraine as most everywhere else you will encounter stony, pebbly shoreline but precious little sand. However, do come prepared for hordes of people. It’s not a terribly large stretch of beach and can become very crowded on a nice summer day when it seems like everyone in the city has taken the day off to come to Arkadia. A visit to Odessa would not be complete without a trip up and down the world renowned Potemkin Steps (officially known as the Primorsky Stairs, but I don’t think anyone calls them that) made famous in Sergei Eisenstein’s 1925 film The Battleship Potemkin, a highly fictionalized account of a 1905 workers uprising which was supported by crew members of the Potemkin, stationed in Odessa harbor. In one of the most famous scenes in film history, Eisenstein depicted hundreds of defenseless workers being slaughtered by Imperial troops on the steps themselves, when in fact the actual massacre took place on the streets of the surrounding area and with far fewer victims than the movie would have you believe. But in true Hollywood style (even though Eisenstein never came anywhere near Hollywood or the U.S.A.) Eisenstein didn’t let a few inconvenient facts stand in the way of rendering history in a fashion more suitable to his own artistic vision. And as anyone who’s ever seen the film can attest, it is a powerful scene which evokes the moral outrage he was striving for. When that baby carriage starts bouncing down the steps in a montage which has been copied and parodied endlessly throughout cinematic history, you realize Eisenstein was one of the first directors to grasp the power of film editing to shock and manipulate his audience. 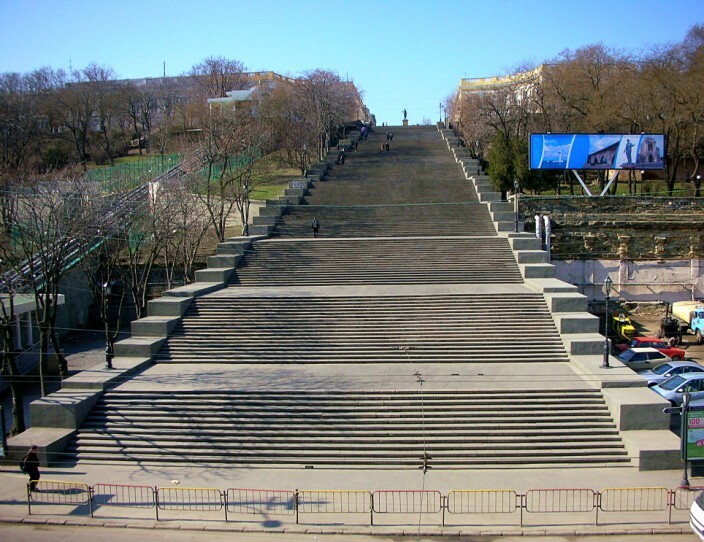 At the top of the steps is a bronze statue of the Duc de Richelieu, governor of Odessa region from 1803 to 1824. A Frenchman by birth, the Duc fled the French Revolution to Russia, served in Catherine’s army during the war with the Turks, and was then appointed to the post of Governor by Catherine for services rendered. Under his leadership the city grew quickly and Richelieu is today considered one of Odessa’s founding fathers and credited with designing the city’s layout and infrastructure. For folks in Odessa today, his statue is the number one meeting place in town. It’s in a convenient, central location and features a commanding view of the port and harbor below. Just say “I’ll meet you by the Duc” and everyone knows what you mean. The steps themselves are a marvel of design and construction. Originally 200 but subsequently reduced to 192 steps during a remodel, they were designed by Italian architect Francesco Boffo and constructed between 1837-1841. The staircase is divided into a series of steps and landings, but when you stand at either the top or bottom they are built so as to conjure an illusion. When standing at the top you see only the landings with the steps rendered invisible, but from the bottom you cannot see the landings so it appears to the eye as a series of continuous steps. Also, the steps widen gradually as you descend, being 12.5 meters or 41 feet wide at the top step, but 21.7 meters or 71 feet wide at the bottom step. This creates a false perspective so that from the bottom they appear longer and taller than they are, while from the top the effect is reversed. Aside from the architectural angle, the Potemkin Steps are also significant to the city geographically as a pedestrian corridor tying the waterfront and port to the interior of the city. And they’re just a lot of fun to walk or run up and down, serving as a hangout for young people, mothers with children, older couples out for a stroll and more than a few camera toting tourists. 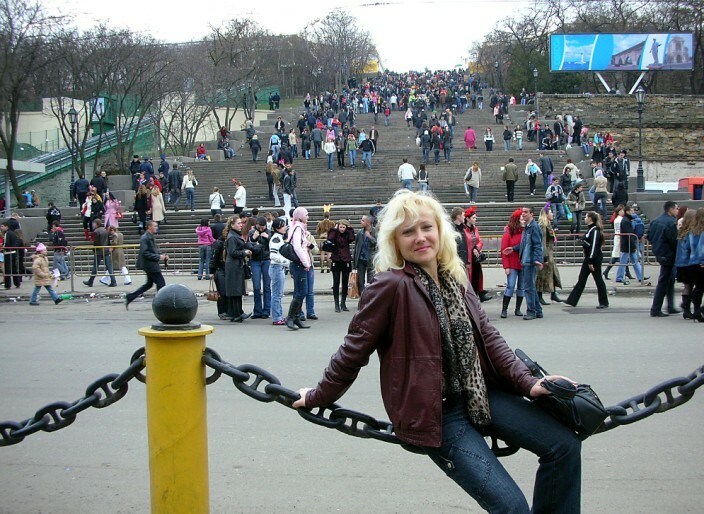 At just about any time of the day you will find dozens of groups of people spending some time on the Potemkin Steps. 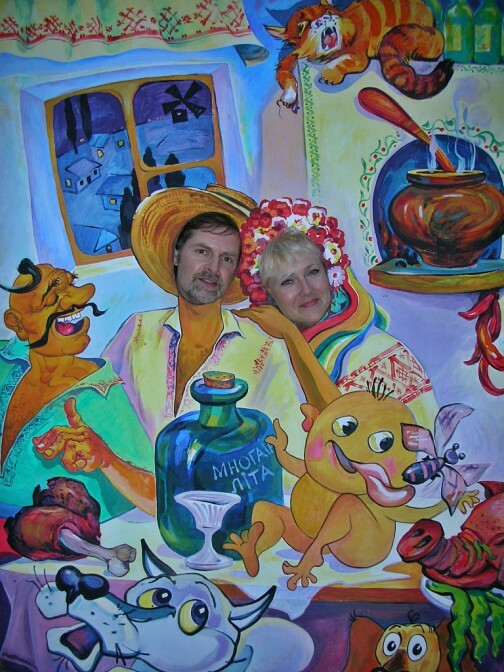 If you are considering a trip to Odessa in the springtime, try to schedule your visit to include the date of April 1. 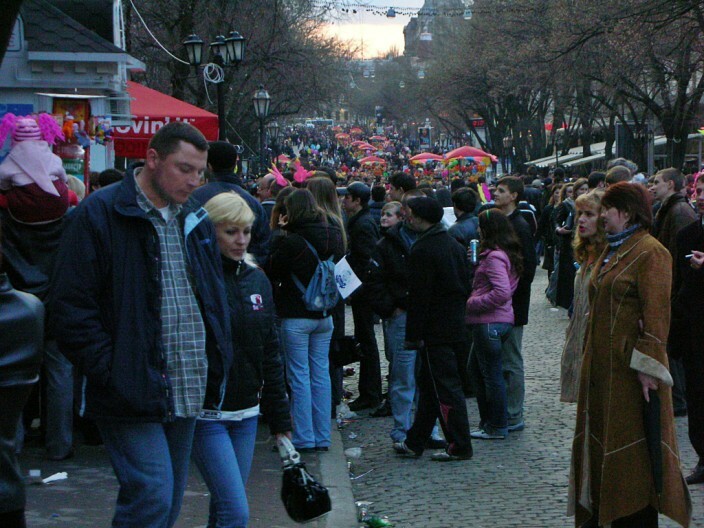 Known to Americans of course as April Fools Day, but known in Ukraine as National Humor Day, Odessa is Ground Zero for this particular holiday. 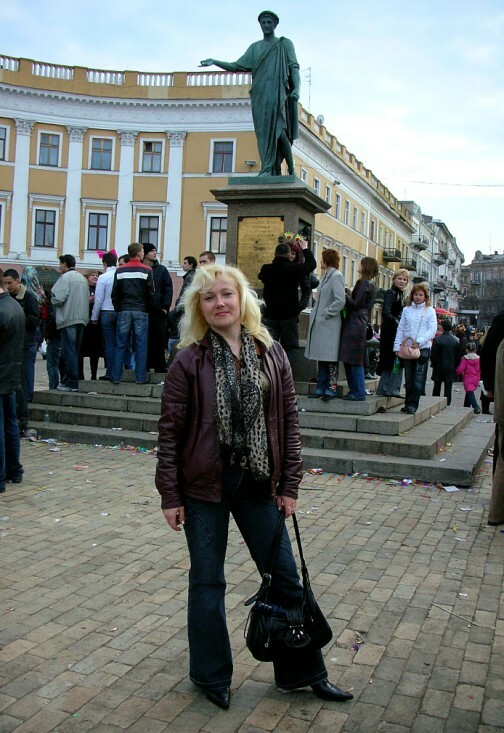 In fact my wife assures me this day is not celebrated half so much in other areas as it is in Odessa, where the entire town goes bonkers for twenty four hours. 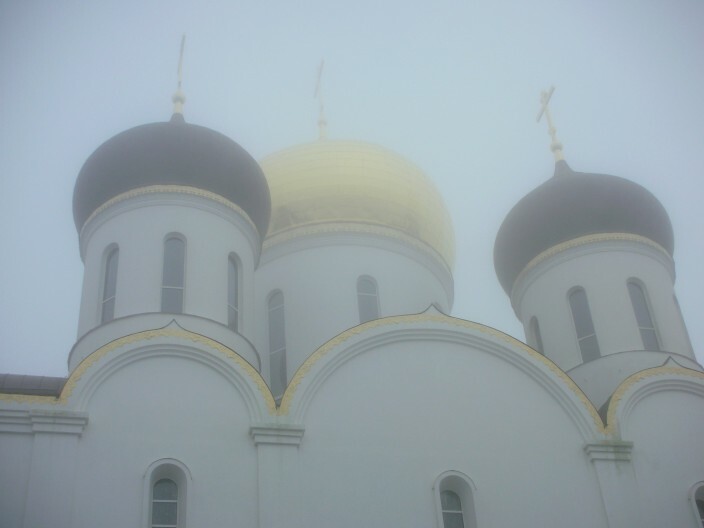 I was lucky enough to be there on April 1 on my first trip to Ukraine and let me tell you, I have never seen so many people milling, wandering, and rambling around aimlessly on any city’s streets in my entire life. If the population of Odessa is a million people, they must have imported another half million for that day alone and believe me, every one of them was out on the streets. Swarming hordes, teeming mobs, great googobs of humanity, use any term you want, it’s a lot of folks. And the funniest part is I could find no particular focus for all this stumbling around, either in terms of location or activities. It really is just a street festival, writ large. There was a massive stage set up on one street with a band playing very loud rock/pop music and a lot of people gathered there, but it was also ignored by an even greater number of people. There were street performers of all sorts scattered everywhere, jugglers, stilt-walkers, skit groups, and comedians galore. 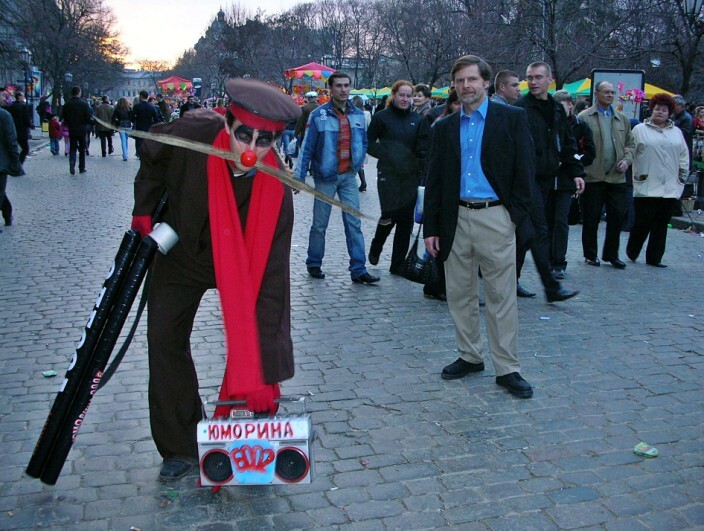 Many of the most famous comics of Ukraine and other former Soviet republics come to town for performances. People wear silly hats and a few don costumes. At many different venues there are booths selling food and drink, and while the words of one acquaintance are certainly true – “Ukrainians celebrate with alcohol” – I also have to say that for the number of people I saw walking around in various stages of inebriation, I encountered no real problems. And to be fair, a majority of people, like us, drank no alcohol at all. Police were out in force, mostly standing around in knots of four or five talking with each other, but they seemed to have little to do. I witnessed no scuffles, no harassment, nothing at all like one might expect from such a large gathering of people where many of them are young and drunk. Maybe the highly visible police presence kept them in line or perhaps if there were problems – and I’m sure there were – we simply didn’t see them. Whatever the case, it was a lot of fun to walk around and simply take it all in, and while I am generally not one who cares for throngs of people, something about this event made it more enjoyable than bothersome. Other sights to see in Odessa are numerous and as in most of Ukraine, many of them are free or very low cost in comparison to other big cities in Europe (or the U.S. for that matter.) Take, for instance, the Opera House, tours free of charge. 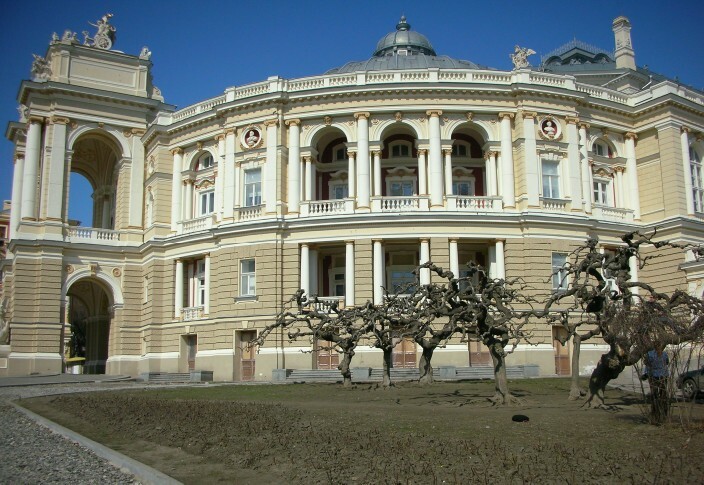 The Odessa National Theater of Opera and Ballet is one of the finest and most beautiful Opera houses in Europe, with unmatched acoustics which can deliver a whisper from the stage to every seat in the house. The original building on this location opened in 1810 and was gutted by fire in 1873. 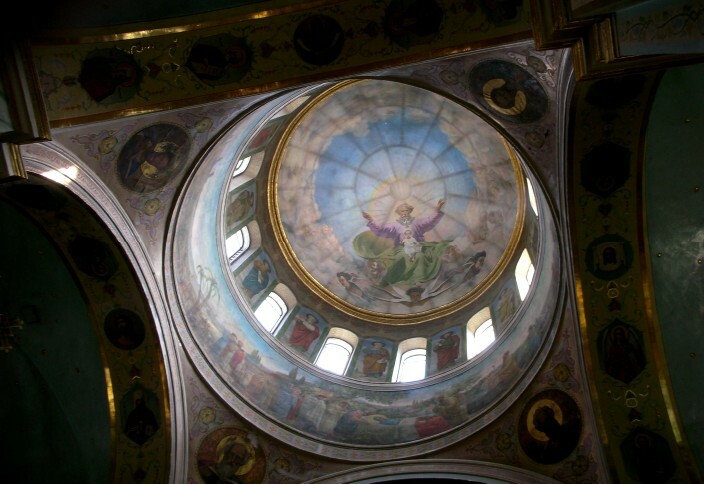 A completely new and redesigned grand hall was constructed on the same site and opened in 1887 at the then staggering cost of 1.3 million rubles. 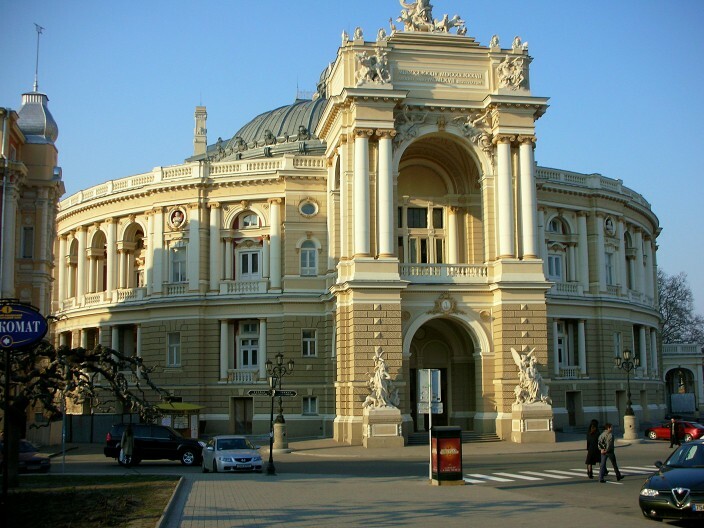 It was the first building in Odessa to use electric lighting, and also employed an elaborate and ingenious cooling system of shafts and tunnels to place wagonloads of ice in the basement during summer performances. The cool air would then rise through vents into the auditorium to keep theater patrons more comfortable. Another major attraction is the Odessa catacombs, which comprise an estimated 2,500 kilometers of labyrinthine passageways, the majority of them being the legacy of stone mining from the 19th century. Most of the city’s homes of this period were built of limestone quarried from right under the city and surrounding region, with a resulting honeycomb of tunnels and shafts left beneath the city. This is often cited as the primary reason Odessa has never had a subway system. The catacombs are not officially sanctioned and are a prime example of Ukraine’s “do this at your own risk” style of tourism. The vast majority of the old passageways are closed to everyone, but even the ones open for touring are not for the faint of heart or anyone whose idea of fun doesn’t run to the notion of potentially being buried alive. Another scary fact is that they have never been fully mapped and there have been instances of people wandering off and getting lost and dying of dehydration and rockfalls. So if you’re feeling adventurous or maybe a little crazy and want to see them, at least have the good sense to go with a knowledgeable guide, stay with your group and not disappear from the rest of your life. Deribasovskaya Street is the main drag in town and the place to see and be seen. It’s named for a Spaniard, Jose de Ribas, another foreigner who fought for the Russians in the Russo-Turkish War of 1792 like the Duc de Richelieu, and considered as much a co-founder of the city as the Duc. Today the street named for old Jose probably boasts more stunningly beautiful women per square meter than any area I’ve ever been in. I don’t know if it’s something in the Odessa water supply or all that fresh sea air or what the reason is, but it’s a sight to behold such a passel of pleasing pulchritude and as good a reason as any I’ve ever known to thank God I’m a man. For any red-blooded male a good time can be had by simply grabbing a seat and a drink at any sidewalk café and watching the parade go by. These are women who are impeccably dressed in highly fashionable clothes, stilleto heels, stylish hairdos and makeup and who are proud to be females and show the world – and all the men watching – what they’ve got. And I’m not talking about a slutty streetwalker type of look or attitude, nor is it only something for the well-to-do. My wife says all Ukrainian women love to dress well and look their very best at all times, even if this means spending a month’s salary on one outfit and eating bread and water for a month afterwards. If that’s the case, here’s to the bread and water diet. In American terms these women are probably a throwback to the 40’s or 50’s, when men were men and women were women and everyone was happy about the difference. For me it’s a healthy and welcome change to what you find nowadays in your average American city (yes, I mean you, P.C. Seattle) where a guy can practically get arrested just for looking at a woman the wrong way. On Deribasovskaya St. it’s nice to know that your admiring glances will be returned with a smile rather than a scowl. Oh, and if you should chance to see two lovely young ladies strolling down the sidewalk holding hands in a very friendly fashion (and you will) they are only that – friends, not lesbians. It’s simply a Ukrainian custom for women to do this. For men, nyet. 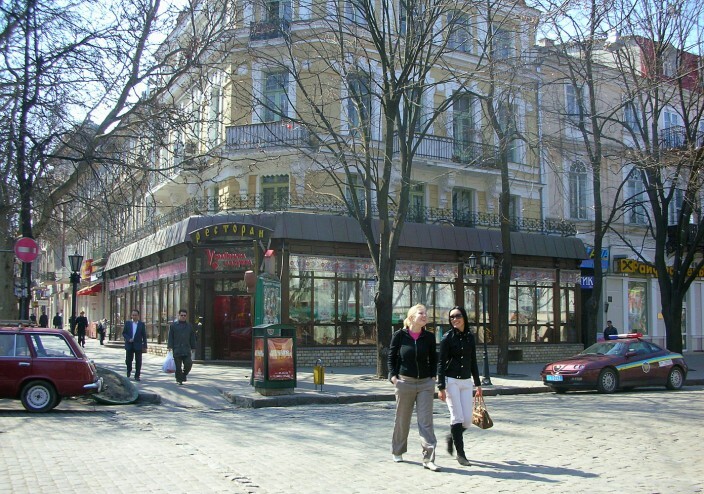 Cafes and restaurants abound on Deribasovskaya and the neighborhood around it, most of them boasting reasonable prices and tasty Ukrainian food or other ethnic specialties. 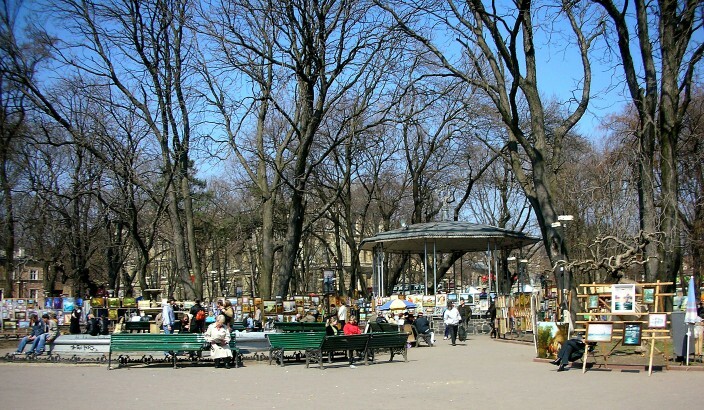 It’s a great city for walking, with lots of parks and museums and outdoor markets to while away the hours. I’ve heard it said there are areas to avoid walking at night, as there are in just about any big city, but during my stay there I walked alone at night around the city center and my waterfront hotel without incident and never felt threatened. Angels going before fools, perhaps. Well there’s lots more to be said about Odessa, but don’t just sit there reading about it. Hop on a jet and get yourself over there. Or hop a jet to Kiev and take the train to Odessa. The airport is a lot better in Kiev, especially the runway. Trust me on this one, I think the tarmac in Odessa is constructed of not very finely crushed, Soviet-era concrete apartment building rubble freshly dumped the day before I landed and never graded, but hey, if you want adventure travel, go for it.